When we mentioned the word's "liquid coolers" and "roundup" to Corsair, they got a bit overexcited and shipped us five of their AIO coolers. 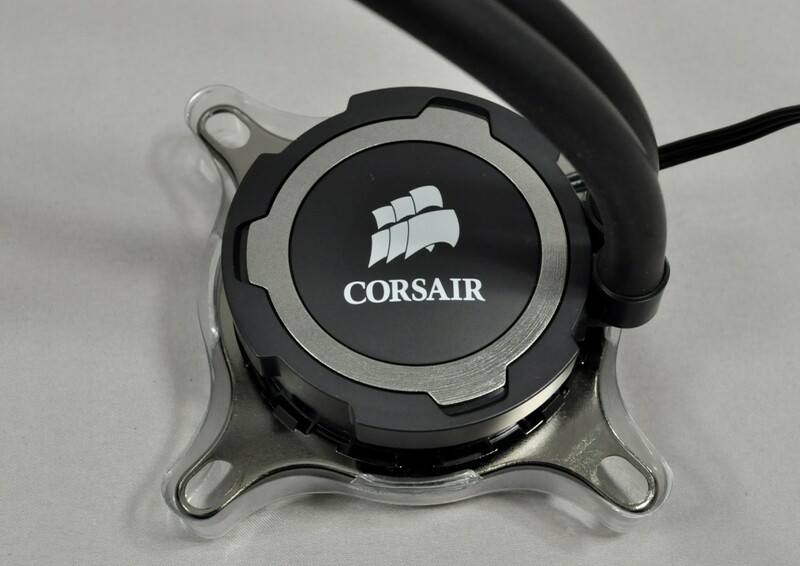 For some reason, Corsair is extremely interested in AIO liquid coolers, which is also reflected by the fact that they are the only company that offers nine such products at this point in time, while most manufacturers are currently limited to just two or three coolers. Despite its "small" number, the H75 actually is one of Corsair's most recent designs. We received it supplied in a serious looking, black cardboard box with a blue visual theme. Inside the box, the cooler is protected by cardboard packaging. Corsair kept the bundle of the H75 down to the very basics: a leaflet with installation instructions and the hardware required for the mounting of the cooler. The bundle is well presented though, with each type of screws/nuts inside a separate nylon bag. Two 120mm fans with grey wide blades are also included in the packaging. The fans have an operating range between 800 and 2000 RPM, which is not very high for wide-bladed 120mm fans. The Corsair H75 is not a work of art but it does stand out visually. It features a rather small radiator that is only 120mm wide and 25mm deep, which offers no more heat dissipation surface than the radiator of the ultra-cheap Seidon 120V. Even though the radiator is of the same design, this time the aluminum fins are virtually free of imperfections, with very few slight deformations visible. The small size of the radiator gives the H75 an advantage in tight spaces but will certainly have an impact on its overall performance. Corsair also went with kink-resistant, smooth black rubber tubing of normal width, rather than the corrugated tubing many other manufacturers are using. The block-pump assembly is round, with a silver ring on top and the company logo painted right in the middle of the cap. It also comes with the retention bracket for Intel CPUs preinstalled. The assembly is held together by no less than 20 screws, 12 for the plastic frames and 8 for the copper base. Thermal compound has been applied on the base from the factory. After our testing, we cleaned the base of the cooler, revealing a well-machined and polished surface. Announced at this year's CES, the Hydro H105 is Corsair's most recent product. It comes in a large cardboard box similar to that of the H75, yet with a red colored theme, which is the signature of Corsair's "extreme performance" products. The bundle of the H105 is almost identical to that of the H75 as well. Inside the box, we find a leaflet with the installation instructions and the necessary mounting hardware categorized inside nylon bags. 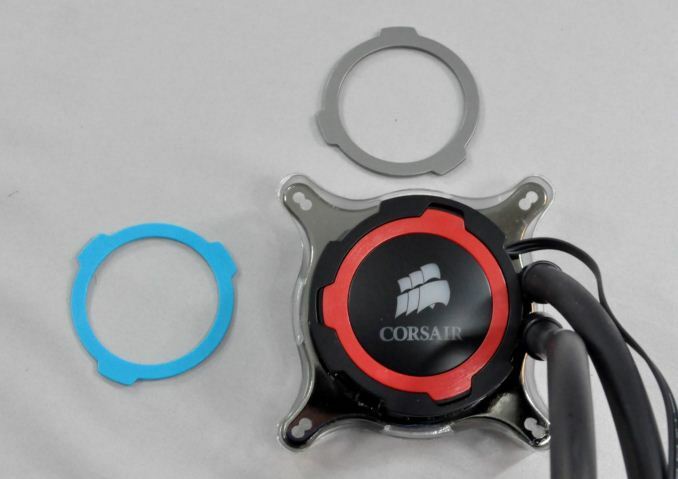 However, we also found two colored rings for the CPU block. Finally, even though the wide grey bladed fans are visually similar to those included with the H75, they actually are not similar at all. The SP120L fans supplied with the H105 are much more powerful, with an operational range of 800 to 2700 RPM. Even though the H105 looks like an oversized version of the H75, there is more to it than first meets the eye. To begin with, the radiator is not only twice as long as that of the H75 but nearly 40% thicker as well, increasing the effective heat dissipation area by well over 150%. Some minor deformations of the aluminum fins are visible this time as well; apparently, the making of such radiators is not an easy process. Although the 120mm width of the radiator makes the H105 compatible with more cases and systems, the length could become a problem, so be especially careful with that. Similar to the H75, the block-pump assembly is round, with a silver ring on top. The silver ring however is removable and replaceable with either a red or blue ring, now included in the packaging. In addition, the company logo is not painted; on the contrary, it has been left unpainted on purpose and a white LED has been placed beneath it. The bracket for installation on Intel CPUs is once again preinstalled and the cooler has thermal compound applied on its base from the factory floor. Once again, the copper base is well machined and polished, free of imperfections.